The 1920s were a colorful decade, filled with flappers and their extravagant clothes, stylish hairdos, and exciting evenings of dancing, boozing, and general partying. The Schuco toy company of Germany created a line of miniature and novelty teddy bears that mirrored these social trends and are now highly sought. These bears were dyed in unusually bright colors, small enough to tuck into a little beaded handbag, and sometimes had hidden novelty features including flasks and compacts. They were charming accessories for flappers of the period to use when touching up their makeup, freshening their perfume, or topping off their alcohol buzz. 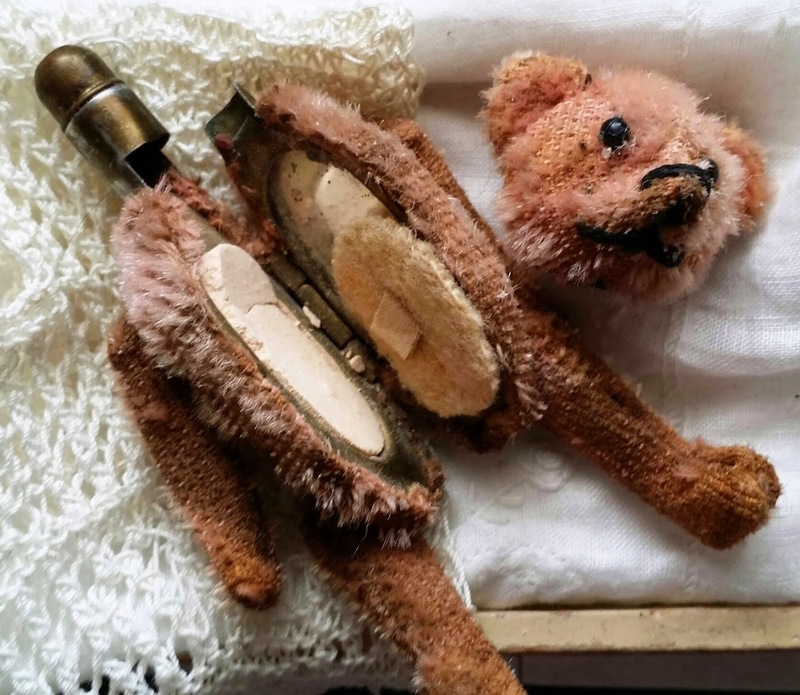 Considering that they usually held lipstick, powder, and liquids like perfume or gin, these novelty bears are rarely found today, and when discovered are usually in poor condition. They're fabulous nonetheless. Above is Schuco's famous compact bear (the pink bear on the left) along with her lavender companion. Both are about 3.5 inches tall. The pink bear has a secret: when her head is removed her torso can be gently opened to reveal a tiny compact inside, complete with lipstick tube, mirror, powder, and puff. This one still has powder after all these years. 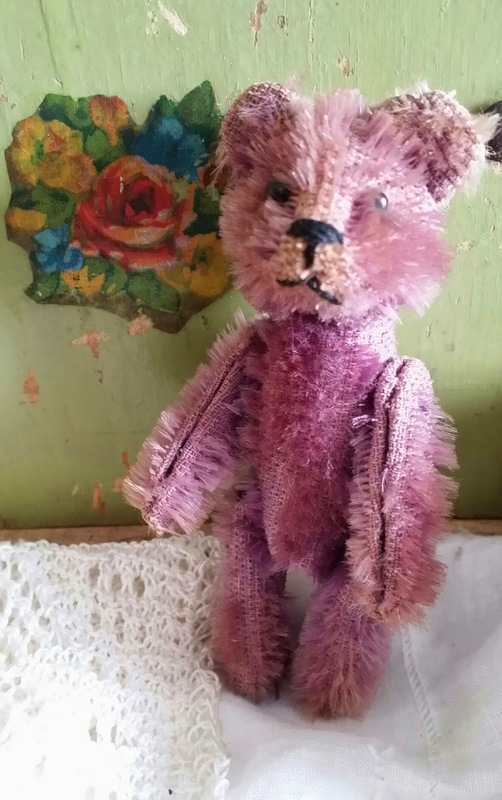 The lavender bear is a lovely shade and still in good condition. 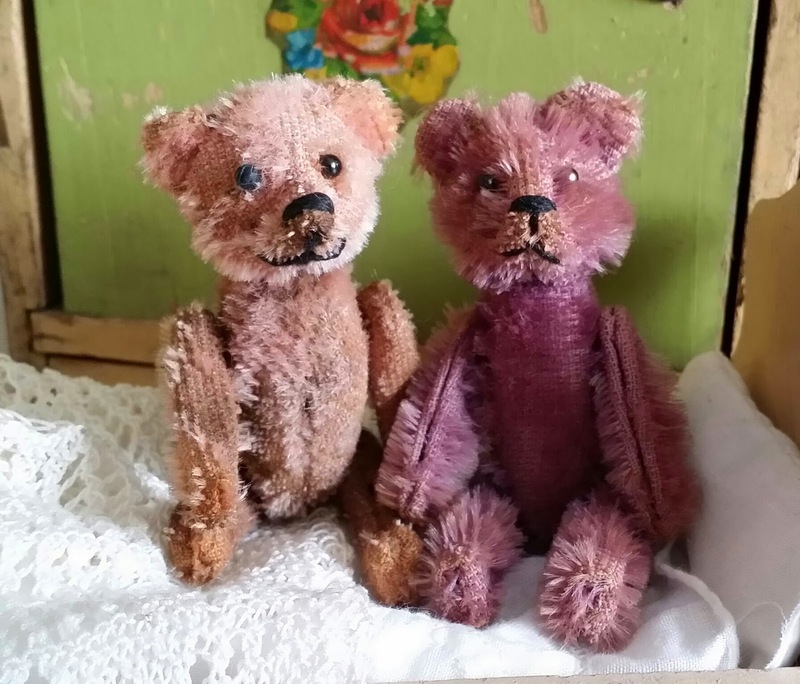 Schuco made these bears in a variety of jewel toned colors including red, emerald green, and purple, and they are scarce and highly collectible today. Hey Tracy! It's been awhile since I've been in here last! I've missed ya! It's so good to hear from you! I haven't had the time for blogging (or reading other's blogs) lately that I used to...I miss it! I'll have to pop over to your sites and see what you've been up to. Hugs! Hi Tracy:). Awwww...I should have told you that i don't have my blog anymore. I'm sure you've noticed by now. If you still have my email address keep in touch! My collections seem to continue growing. A few new bears, dolls, toys...I can't stop! Sorry to hear you don't have your blog anymore, but I can totally understand. It's hard to find the time lately to keep this one up, not sure how much longer I'll manage. Hope all is well with your and your family. Are you still making bears? I should be in here checking to see when you reply to my comments! Sorry sorry sorry! Yes, I still make the bears Tracy! Not as much as Id like to be though. Too many other things getting in the way I guess! Write anytime! Merry Christmas Tracy! Hi, Tracy! I am sorry to be posting a question here, but I cannot seem to find any contact info for you :) I LOVE your Barbie header pic and wondered if it would be acceptable to use in a craft tutorial on my blog - www.dreamalittlebigger.com? I would of course give proper credit and link back to your site so that any readers who want to do the same will come and visit you! Would this be acceptable? P.S. - you have some amazing toys!!! Thank you for your kind comments, and for asking about my picture. Yes, you can use it as you described. I appreciate you asking first, thank you! Sorry for the lack of an email contact: I had one up for awhile, but it caused way too much spam and just an impossible number of requests to appraise people's toys, and I had to take it down. Tracy I Love your blog - Thank you for sharing all the helpful info and Lovely pictures! Hope all is well with you -- loved learning about these bears and their contraband cargo. Look forward to reading about your latest finds. So nice to hear from you! I am well...my new job is just keeping me too busy to blog! I have some fabulous new things I want to post...will try to do them soon. Thank you! Glad to hear your have been enjoying the blog. It's always nice to hear from a fellow librarian: we all seem to have a lot of tastes in common. Thanks again for your kind comments.